So you ALL know that I am a fan of Handful bras and now tanks, too. And you can believe me when I tell you that Handful really is the only bra I ever wear. And now Handful needs our help.. 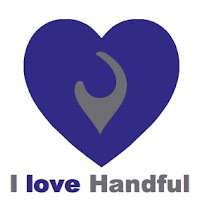 Please click on this link and vote for Handful to win some $$ for advertising and marketing. You have until November 16th to make your vote count! And only if you live in the U.S. I cannot vote, so I am trying to help them by reaching out to my readers... if you are a Handful fan at all, please click on this link and vote! You only have to do it once, promise. you KNOW im telling everyone too. Voted already:) Woohoo! Hope they win!! Is the purple tank you are wearing in that picture from Handful? It is such a cute cut and purple is slowly replacing blue as my favorite color.